Guy of Castris was Abbot of St. Denis (1326-1342), outside Paris. He arranged his collection of saints' lives in 14 books: the first 12 are for the months of the Church year, and the last two contain additions, and the major Church festivals. This copy has an inscription stating that it was given by John Whethamstede, Abbot of St. Albans (1420-1440 and 1452-1464), to Redbourne Priory, a cell of the Abbey. 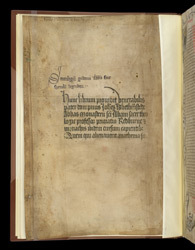 This flyleaf faces the start of the text; the inscription in large black writing records Whethamstede's gift to Redbourne; the smaller one above records the author and title; with at the top edge of the leaf is a note that there is an index at the end of Book XII.